With your financial success in mind, we design our ATMs with a wide range of services that extend beyond simply dispensing cash. You don’t need envelopes or deposit slips at the Envelope-Free ATMs we’re installing across the country. Learn more about the advantages Envelope-Free ATMs offer you and how they benefit the environment. Your time is valuable, so we’ve designed our ATMs to automatically remember your most frequent transactions and show them as a favorites button on the main menu. Whatever your favorite transaction is, you have one-touch access to it so you can get your banking done quickly and conveniently. You can also transfer funds between accounts linked to your ATM or debit card or make a payment to a credit card from an ATM. It’s easy — just choose the accounts and tell us how much you want to transfer. 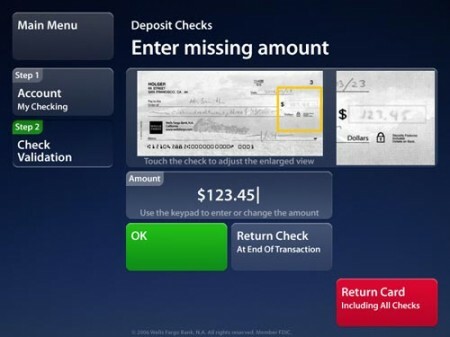 With electronic ATM receipts, you can send your ATM receipt directly to your personal email address or your Wells Fargo Online® secure inbox. 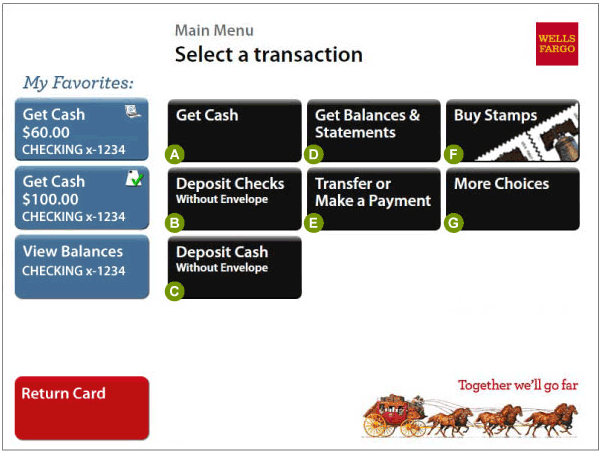 Just sign up for Wells Fargo Online Banking and our ATMs will give you the choice.